This month the meme continues here, at Elephant’s Child, with words and images supplied by Sue. If you are posting on your own blog - let us know, in our comments sections, so that we can come along and read your masterpiece. 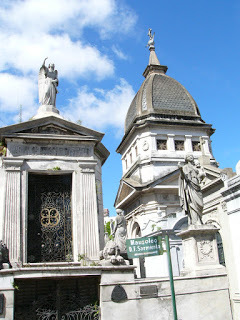 and we also have two images: a mausoleum and an accordion playing clown. Geri had been told that life was a tapestry, with the threads of people's lives being woven into a pattern as their years travelled on. Today, as she stumbled around the square, looking and feeling lost, Geri thought the fabric of her tapestry had been rent in two, forever unfixable. 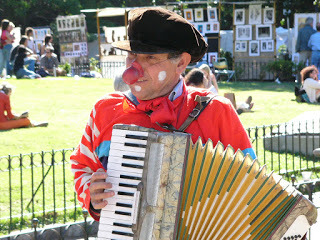 nor hearing the laughter of children and the happy tunes of the clown busker as he played his piano accordion. There had been no early warning signals, no indication at all that her world was about to end. The tragic suddenness of the massive earthquake, the explosions that followed, had taken not only her apartment building, but the ones to either side as well, and the ones behind. Emergency services had been quick to respond, but the fires were too fierce; what had been left standing, was now nothing but ashes and rubble. Geri knew insurance companies' analysis would take a very long time, she herself had once worked for an insurance company. She'd had a "prepare" box for years, never thinking she would need it; documents, identification, spare cash and credit cards, even an extra phone, all stashed in a safety deposit box at a bank far away from her apartment building. Another prepare box, (the insurance companies always recommended people have two, just in case), was in the basement of her parents home, in Kinbrace, Scotland. She wiped away a fresh flood of tears, using the thick bandage on her temporarily useless forearm as a towel. Glancing around, Geri realised she was more than halfway across town and hadn't yet stopped to eat this morning. A few minutes fumbling in her shoulder bag, and she was able to grasp her wallet, pulling it out from the jumble of junk that always seemed to live in there. Spotting a cafe, and moving quickly to the last empty outdoor table, she ordered a double espresso and two serves of croissants with strawberry jam. Then Geri began scrolling through her phone contacts. Who to call? Who to call first? The bank of course, to let them know she was on her way, then her parents to reassure them she was safe and had a place to stay. The Social Services people at the hospital had found flats for the survivors. She'd spoken to her parents the day of the earthquake, they'd been terribly bewildered; Bridport, Wales, wasn't an earthquake area. As far as anyone knew, there had never been so much as a tremor. Feeling better after eating, Geri sat at the small table and watched with amusement as a rowdy mob of men and women marched along the north side of the square. They were shouting something repeatedly and waving placards with antidemocratic slogans on them. Nobody seemed to be taking much notice of them, except the six burly policemen who marched along with them to prevent trouble should anyone start something. Geri realised her tears had dried and she had actually smiled for a moment. Yes, her tapestry had been rent in two, but she was alive and well, apart from the huge gash in her forearm, and she had a place to live, for now. Perhaps this was the plan all along. A new life tapestry would begin, a different pattern would emerge. Lovely. Geri is a survivor. And someone who finds happiness in the small things. Elephant's Child; thank you. Geri will move on quickly, she's not the sort to brood and cry "woe is me". One of your BETTER stories--though they're ALL good!! fishducky; I agree, this one is one of the better ones, because it's complete. Beginning, middle and ending. Most of my others need extra chapters. Lee; thank you, I thought of tapestry when I saw the word fabric.